Posted on November 2, 2010, 8:50 am, by Thomas Hawk, under TMobile. I was disappointed to get a text yesterday from my new mobile provider T-Mobile. The text is above and reads, “Due to the amount of data you have used this billing cycle, your data speed will be slowed for the remainder of the cycle.” When I switched from AT&T to TMobile a few months back (and bought one of TMobile’s fancy new $500+ Android smartphones to replace my iPhone) I did it with the understanding that I would be able to sign up for a plan with “unlimited” data and text. 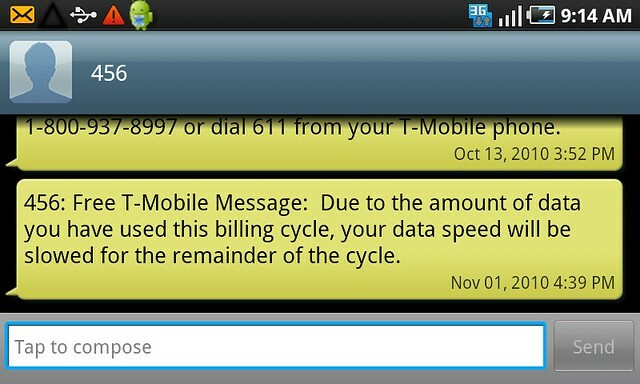 Unfortunately, what it turns out “unlimited” means at TMobile, is unlimited as long as you stay under their 5GB cap. Use over 5GB, like I have, and you get a nasty text message letting you know that they are going to throttle you and turn your web experience on your phone to a crawl. Already this morning I’ve found that the performance on my phone has significantly deteriorated. I’m disappointed that TMobile can get away with this blatant false advertising. I have no problem with TMobile putting caps on their data usage. But if they are going to do this then they shouldn’t be allowed to market their service as “unlimited” web and they should prominently disclose that users of their “unlimited” 5 GB capped limit plan are going to be screwed over and throttled when they pass that limit. Such is the nuance of bait and switch though. I understand a lot of people will say quit complaining. Everybody knows “unlimited” doesn’t really mean “unlimited.” But if this is in fact the case, then TMobile should be required to 1. prominently disclose this fact to consumers so as not to mislead them and 2. maybe come up with a new better term to market their “unlimited” data plans, like maybe instead they could say something like 5GB cap limit, which might not sell as many phones and plans for them but would be a more honest way to market their service.